I love living in Yorkshire. It is a truly beautiful county – especially when the sun shines! This weekend it was still beautiful but also brutal! Average winds were 20 miles per hour with gusts over 4o miles per hour. Intermittent hail stones joined the party. The training plan was 2 x 20 mile runs with a 4-5kg pack. In the wind – do you run in the shelter of woods with the risk of falling branches and trees? do you run on the sheltered but incredibly boring canal bank? or do you get on with it and stick to the planned route taking in the highest point on the moors? We stuck mostly to the plan! Saturday, our training group was 4 – John, Fiona, Renee and I. 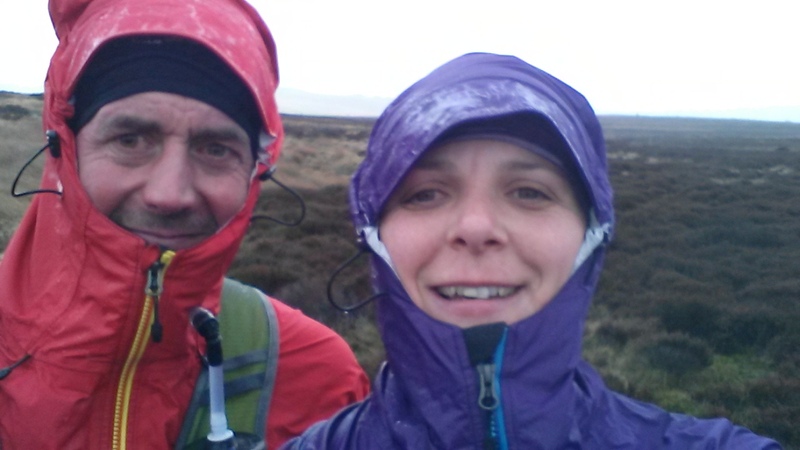 We started with a 12 mile loop around the twelve apostles (to include the ritual circumnavigation of the stones) on Ilkley moor, returning over the Odda. John and I then continued on another 8 mile loop to make it up to 20 miles! We were blown to pieces. the reservoirs looked tidal. But it was fun…. Sunday – time to do it all again. The weather forecast was colder but stiller. Well it was colder but the wind was extreme. Rombolds stride route in reverse (less the top corner). 8 miles in 2.5 hours moving time. The headwind was ridiculous. We could barely move forwards on Ilkley moor. It was more like crawling than walking, let alone running. Occasionally tiny hail stones would batter us in the face – training for sandstorms in the desert – that kept cycling through my mind! Eventually we reached Keighley mast as the bigger hail stones set in. As we turned towards home we had the pleasure of a tail wind. The hail stones ricocheted off our head and shoulder, but with every stride we moved an extra few feet. I loved the running and hop skipping with the wind propelling us. I stopped to wait for John who complemented me on my chicken impression as I flapped my way along the stone flags – but it worked and I had fun for the first time on the run. A somewhat delirious photo, Sunday on Ilkley moor.